One the things I love most about the DC area it the dog friendly atmosphere that is everywhere. From the numerous dog parks to the fido friendly outdoor seating in restaurants, it is well known that people love their four-legged friends here! Not only are pets spoiled by treats from the many gourmet dog bakeries here, but due to the common apartment-like living situations for so many people in the DC area, is not uncommon to find park/green areas all over the city designated just for the dogs! In fact, I am pretty sure pet owners are the majority in the building we live in. Dogs treats await dogs walking in and out of the building and our front desk concierge knows them all by name! It is so fun to live in a city where pets are really considered a part of the family! As Brian and I have been considering adopting another four-legged member to add to our family, we have noticed more and more the high value that DC/VA residents put on their pet's well-being. The adoption process is not as easy as filling out a paper and taking your dog home the same day. I have learned this first hand through my volunteer work with Lucky Dog Animal Rescue. Not only is the adoption process thorough, but rescue organizations go the extra mile to make sure that the adoptable dogs are living comfortable lives with foster families or in doggie day care while they await their forever family. I first volunteered with Lucky Dog at an adoption event in Alexandria. I was a handler that was responsible for walking and introducing my assigned dog to potential adopters. I was pretty sure I wanted to adopt the dog I was assigned to right away and take him home immediately! Of course, there was a lot of interest in him and I believe he was adopted soon after the adoption event. 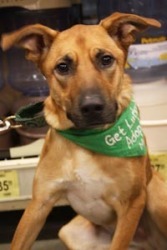 I later learned that Lucky Dog, along with many other rescue organizations, have an adoption procedure that includes an application, interview, reference check, and home visit. Additionally, most adoption fees range around $300 because all the dogs adopted are up-to-date on their vaccinations and are spayed/neutered. This process allows Lucky Dog to do their best to find the perfect match for dog and family! There are many factors that determine if a dog is a good fit for a family. These factors can include; children in the home, other dogs, cats, fenced yard, apartment living, work schedules, breed preference, etc. And of course, in addition to volunteers that give their time and their home, there are so many gracious donors that keep this organization going by monetary donations or sponsorships. While I am most familiar with Lucky Dog, there are many other dog rescue organizations in the DC area that do amazing things and work very hard to find their dogs the best home possible! 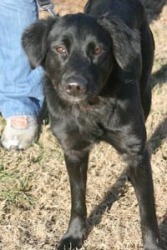 I am happy to announce that Brian and I put in an application for a sweet labrador mix puppy today! We are in the beginning of the adoption process and the next step will be the home visit! I will keep you posted on how that goes! In the mean time, here are some adorable faces that need forever homes!